Maria M. Yip likes to walk 10,000 steps in a day. While she doesn’t always achieve that objective, she is always ready to “go the extra mile” for her clients, who include attorneys, receivers, trustees and governmental agencies. As founder and managing partner of Yip Associates, she leads a growing team of dedicated forensic accounting professionals. 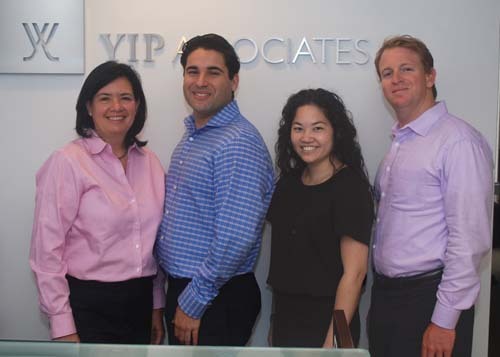 Since founding Yip Associates in 2008 as a sole practitioner, Yip has grown her firm to 19 professionals with offices in Boca Raton and New York, as well as its headquarters in Miami. Fluent in Spanish, Portuguese and Chinese (Mandarin and Cantonese), the firm’s team provides consulting and expert witness services to attorneys and governmental entities in the United States and abroad. Yip also serves in fiduciary roles. She is a member of the Panel of U.S. Chapter 7 Bankruptcy Trustees in the Southern District of Florida, and also serves as Chapter 11 trustee, liquidating trustee, receiver, and assignee. Born in Madrid, Yip grew up in Boston and Chicago, before moving to Miami in 1980. Her Cuban-born parents, as well as most of her relatives, reside in Miami. After high school, Yip enrolled at the University of Miami on a scholarship before transferring to Florida International University. “I was initially interested in the law as a career, but I was anxious to get into the working world and an accounting degree would open those doors,” she says. While attending FIU in the evening, Yip began working for a small Miami law firm that handled personal injury cases. “I began at the law firm as a runner, taking documents to the courthouse and handling administrative work for the firm. Eventually, I became the office manager, handling billing and bookkeeping. This experience gave me an opportunity to see litigators in action and served as great training for the work I would ultimately do and the business that I founded years later,” she says. After earning her accounting degree, Yip went to work for Price Waterhouse’s audit department and later joined the firm’s dispute analysis and corporate restructuring department. She left Price Waterhouse to work at Arthur Andersen and many years later joined Grant Thornton to lead its Florida forensic accounting practice. After launching Yip Associates in Coral Gables, Yip moved her firm to downtown Miami in 2013. The Miami team includes directors Thomas de Araujo, CFE and Kerry-Ann Rin, CPA, both specializing in forensic accounting, bankruptcy litigation and reporting. Last year, Yip opened an office in Boca Raton, led by partners Hylton Wynick and Marcie Bour. Wynick is a Certified Insolvency Restructuring Advisor and Certified Forensic Accountant, specializing in bankruptcy litigation and tax consulting. Bour is a Certified Public Accountant with 30 years of experience as an expert witness in forensic accounting and valuation matters. “We recognize how important it is to our people that they have flexibility with their schedules and working from home. Today’s technology permits us to have that kind of flexibility. Our clients expect our firm to be responsive and we deliver. For this very reason, we need to respect and provide flexibility to our people,” says Yip. Yip Associates actively recruits from several Florida universities but is very selective. “We test candidates on their attention to detail when they arrive for their interview,” she says. Whether serving as a fiduciary or tracking the flow of funds in a fraud case, Yip enjoys being an investigator in both the real and digital worlds. “I’ve seen things posted on social media sites that have answered questions in some of our cases,” she says.